If you love running, but it kills your ankles when you do it, you don’t have to give up your need to cross finish lines. With the proper gear, you’ll be able to indulge in race after race without hobbling your way back to your car afterward. With the best ankle brace for running, your ankles will get the support they need while you chase your dreams. How Do I Know If I Need an Ankle Brace? There are a few situations in which runners would benefit from adding an ankle brace. Those who are rehabbing from a recent injury, such as a sprained ankle, will want to use one for at least the first few runs so they can protect their ankle as they get back in the saddle. If you’ve recently increased your mileage while training for a long-distance race and you already know you have weak ankles, you’re asking a lot of your body. Bumping up your distance, especially if it’s more than the recommended 10-percent mileage increase a week, can wreak havoc on your body. It sets the stage for running injuries, like ankle problems. As you increase your mileage and you begin to notice ankle pain during your runs on a regular basis, you have two choices -- you can cut back on your mileage to give your body time to heal or you can check into the temporary use of an ankle brace. Since most runners would rather endure some pain than give up their racing goals, here is what an ankle brace can do for you. It can give you compression and enough stability that your weak ankles will be able to get through your training without becoming a full-fledged ankle sprain. If you do a lot of trail running that requires you to run on loose rocks and uneven ground, you might feel more comfortable with an ankle brace for added support. If you have weaker ankles, running on trails can be risky, so you might want to add an ankle brace even if you haven’t officially landed on the injury list yet. What Are the Drawbacks of Ankle Braces? Before you think about adding an ankle brace as a preventative measure because you’re planning to increase your running distance and you don’t want to risk getting hurt, you should slow down. You should only use one if you really need it because there are some drawbacks to using them. Regular use of ankle braces can reduce your ankle’s full range of motion. While that may be good if you’re trying to introduce more stability as a temporary fix, over time it could become a real problem. Your ankles can become weaker and wearing braces can cut back on your speed as well -- which is something no runner appreciates. When you’re using an ankle brace, you want something that doesn’t confine your ankle too much. Yes, you’re wearing it for the additional compression and support, but you still want it to feel somewhat mobile. You need to have some movement in order to be able to hit your natural stride. You’ll also want something that doesn’t weigh too much or you’ll feel uncomfortable and potentially lopsided during your run. How much support you need: You need to figure out whether you need gentle support, a moderate amount of support, or a lot of support for your ankles. The level of support you need will depend upon the level of the injuries you’ve had in the past and where you are in the rehab process. The type of brace you want: You could go with a lace-up brace, which is simple to put on. It can be adjusted to fit your comfort level as well. Another option is a sleeve that will give you added compression to reduce swelling in your ankles when you run and they’ll also give you some firm support without being overwhelming. 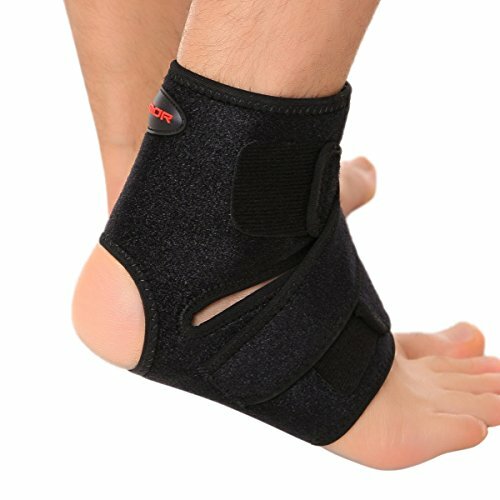 You can also go with braces using Velcro straps which add extra support to completely stop your ankle from doing any rolling. How comfortable the brace is: If you can’t stand to run in fabric that traps the heat, you may hate some types of braces. When you really need the support, you can try a milder ankle brace that allows you more breathability and flexibility, but that may not be enough if you’re returning to the sport after a severe injury. You may not be able to find a brace that you love, but you should be able to find one that you can tolerate. How easy it is to put it on: If you feel winded just from the struggle to put on your ankle brace, you’ll skip your workouts rather than spend 10 minutes fighting your ankle brace. You’ll want something that you don’t mind using and is simple to put on. The crisscross straps on this ankle brace means that you get a lot of support from an ankle brace that doesn’t look intimidating to put on. This brace will cut down on any swelling you get in the ankles while running. It’s made of moisture-wicking material, which means your foot and ankle won’t be a sweaty mess during your run. 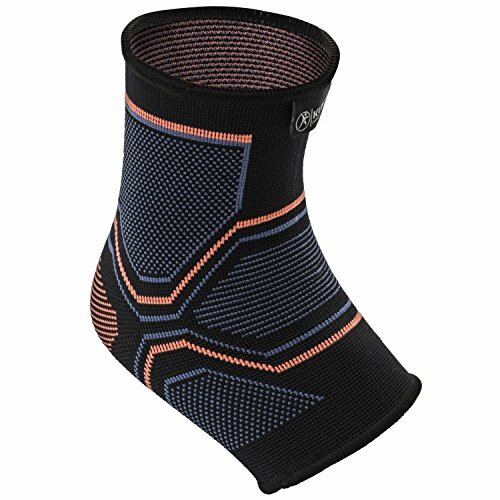 The fabric won’t leave you with an insanely irritating or itchy feeling under your brace while you’re running. Since the air will move through this wrap, you won’t get much odor like you would with a less breathable ankle brace. The heel on this brace is open so you will have more mobility, which is nice for runners who don’t want to feel like they’re running in a full cast. The Velcro straps are easy to put on. The straps can be adjusted to handle different sizes of feet. They are lightweight enough that you won’t feel weighed down on your run. You can clean them in your washing machine, which is a time saver over hand washing them. They have to air dry. Some runners have had problems fitting this ankle brace inside their shoes. These ankle braces can fit a wide assortment of ankle sizes. They can work for men’s sizes from 3 to 14 and women’s sizes from 4 to 15. So no matter what size of foot you have, you should be able to find a size that works for you. These braces offer a decent amount of compression on the ankle, heel, and arch. They help cut down on the swelling you experience after an injury. Because of the toeless design, you’ll be able to fully move your foot if you want to while wearing this brace, which is nice for runners who don’t want complete immobilization. This brace feels soft on your skin and won’t feel itchy. It’s lightweight so you won’t feel extra fatigue in one leg when you’re done running with it. The company offers a money-back guarantee, which is nice for runners who have been burned before by products that weren’t worth the money. 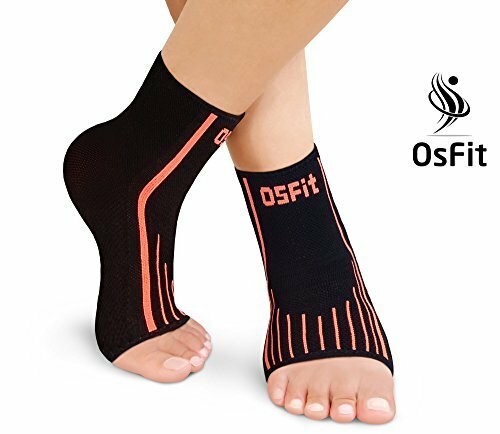 This comes with two braces, one for each foot, which is nice for runners who have weak ankles, instead of an injury in one foot they are dealing with. They run a little small in sizing, so you may want to order up a size. The seams are a little thick, which can be uncomfortable on the bottom of your foot. 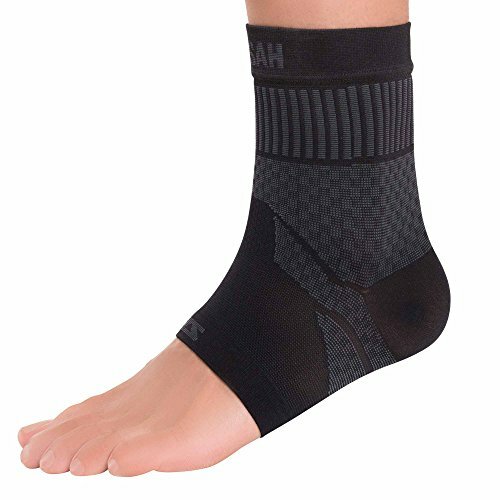 If you hate running in braces that are thick and feel bulky in your shoes, you may like this Zensah ankle brace. It is so thin you shouldn’t feel any lumps or bumps while you’re running in it. This toeless design won’t feel overly restrictive with your movements, which is nice for runners who are just looking for some lighter support. The fabric offers breathability and it wicks away the moisture, so you won’t feel like you’re running in soggy, tight socks by the end of your long run. The fabric is textured so it gives you some arch relief with your movements. 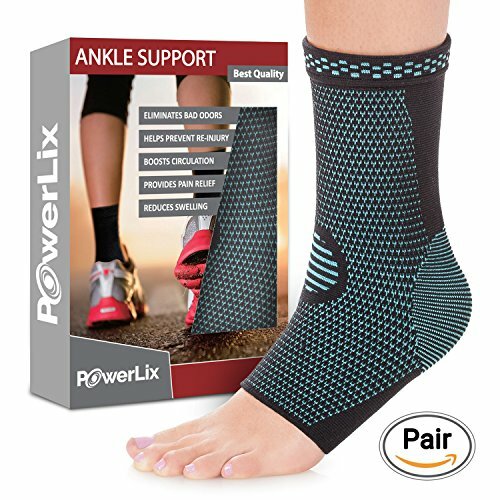 It offers enough compression to cut down on any swelling in the ankle area. The material is seamless for your comfort. If you struggle with foot odor, this anti-odor brace may appeal to you. Unlike some ankle braces that only come in black, this brace comes in five different color selections. You’ll need to measure the circumference of the widest part of your ankle to find your correct size -- you can’t just go by your shoe size. It seems to run a bit small, even when sized correctly. Whether you have unusually thick or thin ankles, this brace can offer a size that will work for you. This brace offers four-way stretch, so you’ll get full mobility with it as it offers great compression to keep your ankle from rolling on your run. The fabric feels soft and smooth so your skin won’t be irritated, even while you’re sweating. It will wick your sweat away, leaving you feeling dry. This brace will fight odor so you won’t have to wash it as frequently. It won’t slip down as you’re running so you won’t have to constantly stop your run to tug up your ankle brace. To make you feel more confident in your purchase, this company offers a six-month money-back guarantee. You’ll get two ankle braces with this brand. This is a really tight brace, so if you are between sizes, make sure to size up. Because of how tight these are, you won’t want to wear them for a long run, just for your shorter runs. If you still want to have enough flexibility to move your ankle while you’re wearing an ankle brace, you may like the Kunto brace. It gives you support while still letting you have your mobility. You won’t suffer from itchiness on your run while you wear this brace. The breathable material will let you feel some air flow on the area that’s covered by the brace -- that’s nice for runners who get too hot during their workouts. Runners who find other braces too tight or too loose may like these -- the fabric weave gives you a fit that doesn’t feel constrictive and it won’t slip down while you’re running. This company gives you a money-back guarantee. The brace will hold up well after repeated washings. This brace is comfortable -- it just feels like a thick sock when it’s on. After months of heavy use, some runners have had issues with this brace stretching out. The fabric ends right under the arch of the foot, which some runners may find annoying. If you’re only looking for mild support, the Kunto ankle brace may be the best ankle brace for running. It’s not overly restrictive, which is nice for runners who still want to feel a full range of motion when they run. But it’s tight enough that it won’t slip or roll during your run. The material feels soft, which is a bonus if you wear it under your sock. You’ll get some breathability to help you feel cooler during your run. It doesn’t feel heavy or thick like some braces do, so it’s comfortable to wear, even during your long runs.